On 10 October 2017, Catalonia issued and then immediately suspended its declaration of independence, and urged Spain to negotiate. Spain does not want to negotiate. Rather, it sought clarification as to whether or not Catalonia’s manoeuvre indeed was a declaration of independence. Such clarification was needed, according to Spain, in order to decide on an appropriate response. Subsequently, Spain announced its plan to remove certain political leaders of Catalonia and impose direct rule on the region. The recent situation in Catalonia has already been addressed on this blog (see here and here). What is striking – or perhaps not – is how little international law actually has to say on secession and indeed even on statehood. Statehood is quite simply a politically-created legal status under international law. Catalonia is yet another proof that statehood is a complicated nexus of law and politics which cannot be explained by legal rules alone. International law merely delineates the field for a political game. Just as studying football rules cannot tell us which team is going to win – Barcelona or Real – studying the law of statehood alone cannot tell us how states emerge. We need to see the game played within certain rules. In this post, I will explain the international legal framework that defines the rules of the political game and argue that the game itself may be much more influenced by comparative constitutional rather than international legal argument. In the modern world, new states can only emerge at the expense of the territorial integrity of another state (see here for details). The emergence of a new state is then a political process of overcoming a counterclaim for territorial integrity. Sometimes states will waive such a claim – the United Kingdom was willing to do that with regard to Scotland. Where the parent state does not waive its claim to territorial integrity, an attempt at secession is unilateral. The international law on unilateral secession is determined by the Kosovo Advisory Opinion para 81 and the Quebec case para 155. It follows from Kosovo para 81 that unilateral declarations of independence are not illegal per se, i.e. merely because they are unilateral, but illegality may be attached to them in situations similar to Northern Cyprus and Southern Rhodesia. This is not the case with Catalonia. Pursuant to Quebec para 155, the ultimate success of unilateral secession depends on recognition by other states. This pronouncement may sound somewhat problematic in light of international legal dogma that recognition must always be declaratory. Where independence follows from a domestic settlement (e.g. had Scotland voted for independence in 2014), recognition indeed plays little role. But the Supreme Court of Canada was quite right that recognition is much more instrumental – even constitutive – where a claim for independence is unilateral. On 16 March 2014, Crimea held a referendum on its future legal status. Reportedly, the choice to join Russia was supported by an overwhelming 95.5 per cent of all votes cast, with the turnout of 83 per cent. A day earlier, Russia vetoed a draft Security Council resolution which sought to declare the referendum as ‘having no legal validity’ and urge the international community not to recognise its results. The draft resolution was otherwise supported by 13 members of the Security Council, with China abstaining. On 17 March 2014, the Crimean parliament declared independence and applied to join Russia. This contribution explains that while the referendum itself was not illegal in international law, the shift of territorial sovereignty would be illegal. Moreover, in the legal circumstances underlying the situation in Crimea, even the declaration of independence violated international law. As a result, the obligation to withhold recognition of the effective situation is applicable under general international law. No Chapter VII Resolution is required. This is not because international law would see territorial integrity of states as an absolute norm, but because the effective situation was created by Russia’s use or threat of force. Although parallels have been drawn to Kosovo (see the discussion in Christian Marxsen’s post) and even Scotland, in terms of international law Northern Cyprus would be a more accurate comparison. Groups seeking independence usually present self-determination as an absolute entitlement. Conversely, states countering secession usually present territorial integrity as an absolute entitlement of states. Neither camp is right. As follows from the General Assembly’s Declaration on Principles of International Law (GA Res 2625), the Quebec case (Supreme Court of Canada) and partly also from the Kosovo Advisory Opinion (ICJ), international law is actually neutral on the question of unilateral secession. This means that unilateral secession is neither prohibited nor an entitlement. Furthermore, for the purposes of international law, it does not matter whether or not secession is explicitly prohibited under domestic law. As noted by the Supreme Court of Canada in the Quebec case, an entity may declare independence extra-constitutionally and yet nevertheless become independent if other states are willing to recognise it (the Quebec case, para 155). This further confirms that unilateral secession unto itself does not trigger an obligation to withhold recognition. [I explain this further here].Yet states are very rarely willing to grant recognition on a widespread basis to entities seeking independence unilaterally. By holding a referendum and declaring independence, such an entity in most circumstances does something that remains legally ineffective, yet not internationally wrongful. The burden of changing the territorial status quo lies on the secession-seeking entity and this exercise is very rarely successful if the parent state does not agree. However, a declaration of independence may be given effectiveness through foreign military assistance. This is where neutrality of international law ends. International law is neutral only with respect to a declaration’s unilateral character, but not in general, where territorial illegality is attached to the situation. When are declarations of independence illegal? I would like to thank Dapo for his response to a particular claim I make on the statehood criteria. It is a twofold claim that I make in the book. First, the emergence or non-emergence of states cannot be explained by the Montevideo criteria. Secondly, the Montevideo criteria should not be seen as a rule of customary international law. I sense that Dapo could partly and qualifiedly agree with the first part of the claim. He certainly disagrees with the second part. Dapo’s proposition essentially preserves the centrality of Montevideo by accommodating the process of state creation within these criteria. In so doing the proposition overcomes the deficiencies of Montevideo and the solution indeed looks very appealing at first sight. But it is problematic, as it makes the relationship between state creation and statehood criteria circular. In a world where virtually every territory is a state territory and thus subject to a legitimate claim to territorial integrity, this claim can only be overcome by a political process which creates a new legal status. I think that Dapo and I agree up to this point. We diverge on the question of the place of this process and its relationship to the statehood criteria. Dapo accommodates the process within Montevideo, I place it outside; Dapo subordinates the process to Montevideo, I subordinate Montevideo to the process. I am pleased that Professors Jean d’Aspremont and Brad Roth both seem to approve of my proceduralised approach to state making which, inter alia, degrades the Montevideo criteria from customary law to a mere under-labourer of a political process. Their criticism is politely measured but if I had to identify one core word to capture the gist of their remarks, that word would be ‘objectively’, albeit in two different meanings. First, there is the issue of the theoretical underpinnings of my work and the question of whether statehood can be objectivised. Do I indeed take a schizophrenic position on that? Secondly, synthesising international practice requires analysing and interpreting history. Whose story should an international lawyer choose to tell? In the context of the present debate, was the Badinter Commission interpreting, misinterpreting or developing the law? If I try to eliminate Prof d’Aspremont’s proverbial politeness, in blunt language he is telling me: “You are crusading against objectivism in the law of statehood, yet you are an objectivist yourself, albeit you get there only after a detour.” D’Aspremont is right, while claiming that states do not emerge objectively and self-evidently, it underlies my writing that at some point statehood is achieved and then it becomes objectivised vis-à-vis the international community as a whole. In my defence, let me say something on that ‘detour’. In the book Democratic Statehood in International Law, I develop an argument that state creation is a political process of overcoming a competing claim to territorial integrity. The emergence of a new state is not an automatic or factual occurrence upon meeting the statehood criteria. The process requires some democratic procedures to be followed. It often also runs in parallel with an internationalised attempt at imposition of a democratic political system. The post-Cold War practice and the effects of the right of self-determination have led some writers to proclaim that under contemporary international law a newly-emerged state needs to be democratic. Others have rejected this view by holding that democracy has not b ecome a statehood criterion. My argument is that the first statement is exaggerated and the second one wrongly-focused. Non-democratic states can emerge in contemporary international law, but so can states that do not meet the statehood criteria. In the process of state creation, the adoption of democratic institutions is equally as relevant or irrelevant as ‘Montevideo’. Considerations for democracy may impact state practice in relation to claims for independence but do not have any direct legal effects. The same can be said of the Montevideo criteria. Via the right of self-determination, state-creation nevertheless does require a democratic process. This is a requirement for independence referenda, not a requirement for a particular political system. The right of self-determination should not be conflated with democracy. Jure Vidmar is Leverhulme Early Career Fellow in the Oxford Law Faculty, and Research Fellow, St Johns College, University of Oxford. 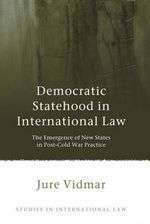 His book Democratic Statehood in International Law: The Emergence of New States in Post-Cold War Practice will be published in March 2013. As has already been noted on this blog (here and here) Professors Alan Boyle and James Crawford recently drafted an opinion on the international legal consequences of the Scottish referendum on independence. The Boyle/Crawford argumentation is very straightforward and, in my view, a conventional and uncontroversial account of the applicable international legal framework. However, I see one potential problem which was not (or could not) be considered in the Opinion drafted in December last year. In January 2013, Prime Minister Cameron announced another referendum; this one would be on the UK exiting the EU. Which UK would exit – the one with or the one without Scotland? It is true that this referendum is not a legal reality at this stage and is merely a political pledge to be fulfilled should the Conservatives win at general elections. But with this possibility on the table, it is not entirely possible to separate the two referenda. Given the special nature of the EU, it is arguable that Scots now no longer know for what kind of an arrangement they are voting if they choose to stay in the UK. Or to put it differently, Scots do not know whether a vote for the UK is also vote to stay in the EU. And this may well be problematic under international law which requires that terms of a referendum on independence should be clear and unambiguous. Does General Assembly Resolution 67/19 Have Any Implications for the Legal Status of Palestine? Jure Vidmar is Leverhulme Early Career Fellow in the Faculty of Law, and Research Fellow at St Johns College, University of Oxford. He has written widely on the process of State creation (see SSRN page here), including: ‘Explaining the Legal Effects of Recognition’ (2012) International and Comparative Law Quarterly 361. On 29 November 2012, with 138 votes in favour, nine against and forty-one abstentions, the General Assembly adopted Resolution 67/19, which, inter alia, “accord[ed] to Palestine non-member observer State status in the United Nations…” This post considers whether the vote in the General Assembly objectively confirms that Palestine is a state and/or whether the General Assembly on 29 November 2012, in fact, created a new state (a matter considered briefly by Dapo at the end of his post on the Resolution). In essence, did the Resolution change anything in terms of legal status and did Palestine on 29 November become more of a state than it was on 28 November? The post thus narrowly focuses on the implications of Resolution 67/19; it does not intend to clarify Palestine’s legal status in general.